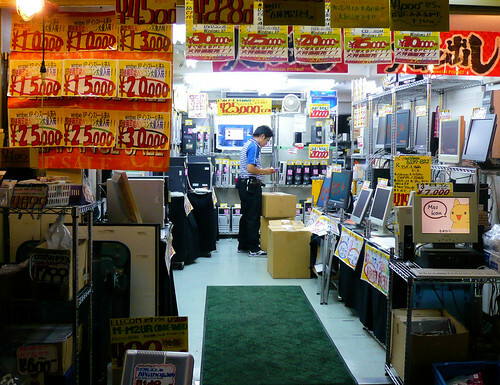 Consumer PC sales are forecast to slow – again. CC-licensed photo by DocChewbacca on Flickr. A selection of 14 links for you. Sorry, long extension. I’m @charlesarthur on Twitter. Observations and links welcome. The company said the addition of a single machine can cut a few hours a day of work previously done by a human, or allow Walmart to allocate fewer people to complete a task, a large saving when spread around 4,600 US stores. Executives said they are focused on giving workers more time to do other tasks, and on hiring in growing areas like e-commerce. What’s the betting they’ll go with “allocate fewer people to complete a task”? A fast-food diner I occasionally go to used to have waiter service; now you go to the counter to make your order. The staff dislike it (less interaction with people), diners dislike it (more queing), but guess what: more money for the owners. Google cofounders Larry Page and Sergey Brin have yet to make an appearance at any of the company’s weekly “TGIF” town halls in 2019, BuzzFeed News has learned. Their absence from these meetings, the longest attendance lapse in company history, comes at a time when Google is wrestling with tough questions from its employees on a variety of issues, ranging from harassment to censorship. The town halls give Google employees a chance to ask questions of leadership with no limitations, and are a key element of Google’s transparent workplace culture. They regularly feature an introduction from leadership, a presentation from a team, followed by time for employee questions. For years, Page and Brin have attended, either individually or together, and faced questions from Google’s rank and file about the company and its direction. Asked when their last TGIF appearance was, Google declined to comment. Are they bored with their toy? Uninterested in their staff? Yet Google’s facing more questions than ever. Mad Max Zombies, an Android first-person shooter full of spurting blood, disturbing imagery of walking corpses and realistic firearms, was rated by its creator as Pegi 3 – a rating that’s considered suitable for all age groups, with no sounds or pictures that are likely to frighten young children and only the mildest, most childlike depictions of violence. …In contrast to Apple, which has a strict age rating policy and approval process on all apps, Google seemingly does not invest its profits into building a robust, human-monitored system to ensure that all age ratings across its platform are correct. In fact, there’s very little control whatsoever of ratings given to games that can be downloaded by children through the Play Store. Behind the scenes, each game’s age appropriateness is assigned automatically by a questionnaire filled in by its creator. For anyone downloading a game, the Play Store displays an official Pegi age rating, despite there being no manual monitoring and rating for individual titles. Too reliant on algorithms. If Apple can afford humans to check this stuff, why can’t Google? Chinese state planners want to phase out China’s vast Bitcoin and cryptocurrency mining sector, in a move that will further push miners away from the country—which controls an estimated 74% of global Bitcoin mining power. Love the “building out its blockchain capabilities for surveillance purposes” – which is slightly “but it’s so UNFAIR that they’re using this and stopping that.” Think this is going to crimp bitcoin quite a bit, quite soon. An new unit will develop interactive programming and live specials under Ben Relles, who had been overseeing unscripted programs, the Google-owned company said Tuesday. Relles, who has worked at YouTube for eight years, just started in the role and is still exploring the best ways for YouTube viewers to participate in stories. “We now have amazing new tools and opportunities to create and tell multilayered and interactive stories,” Susanne Daniels, YouTube’s head of original programming, said in a statement. Notice that it has shut down its VR studios, but is opening up this avenue. Netflix has really blazed a trail here with Bandersnatch, but it’s difficult to pull that off again and again. About a quarter of the company’s users are based in Europe, where it has been growing faster than the US, according to Chris Misner, president of Roblox International. He said Roblox, which was founded in 2004, had completed its first wave of growth in the US and Commonwealth countries and would now look to continental Europe and Asian markets for further growth. Roblox’s rise has gone relatively unnoticed by many adults, but its monthly active userbase of 90m people rivals some of the world’s most popular games, including shooting blockbuster Fortnite and Microsoft’s Minecraft, which have 78.3m and 91m monthly active users respectively, according to figures reported last year. Unlike those titles, Roblox acts as a marketplace where users build their own games and virtual worlds that become more or less prominent based on their popularity with users. In this respect, the platform has become like a YouTube for games, which founder David Baszucki said enables developers to monetise their inventions. Basically, having laid waste to local journalism (along with Google), Facebook now finds there’s none to report. But also: its algorithms don’t know how or where to look. A record 83% of U.S. teens own an iPhone as of spring 2019, according to investment bank Piper Jaffray’s semiannual “Taking Stock With Teens” survey of around 8,000 high school students. Respondents were roughly 54% male and 46% female with an average age of 16.3 years. Meanwhile, 86% of U.S. teens expect their next smartphone to be an iPhone, matching an all-time high set in fall 2018. This metric has steadily grown in Apple’s favor over the years, rising from 75% in spring 2016. The survey found that 27% of US teens own a smartwatch, while 22% of respondents plan to purchase an Apple Watch within the next six months. By comparison, 20% of teens said they plan to purchase an Apple Watch in the next six months in the year-ago survey. That’s a lot of Apple Watches. Surely the peak audience. What’s not clear is whether the app could grab those contacts, photos etc without the user’s permission, or whether iOS’s permissions structure is robust against that threat. Of course the social engineering side – “this app needs to access…” – can still work. Pretty soon people are going to start doing this for their own entertainment. And then you’ll get people claiming to have solved murders. It could get to be a big mess. “For the eighth consecutive year, the PC market is at a standstill,” said Ranjit Atwal, research director at Gartner. “PC shipments will total 258 million units in 2019, a 0.6% decline from 2018.” Traditional PCs are set to decline 3% in 2019 to total 189 million units. Slow upgrade on phones (though by 2023 foldables might be 5% of high-end phones – that’s tiny), and consumers are retiring but not replacing their PCs. Tech stasis. The Event Horizon researchers are going all-out with the announcement, which is scheduled for this Wednesday, and they’ll be holding press conferences in multiple languages simultaneously all around the globe. The announcement is scheduled for 0900 EST [1400 BST, 0600 PST] on Wednesday, April 10th. And the entire event will be streamed online via Facebook as well as the ESO’s official website. That’s today, if you’re reading this on April 10. Let’s hope it’s more than a slide with a black dot at the centre. Fiat Chrysler Automobiles has agreed to pay Tesla hundreds of millions of euros so the electric carmaker’s vehicles are counted in its fleet in order to avoid large fines for breaking tough new EU emissions rules. The move will allow FCA to offset CO2 emissions from its cars against Tesla’s, lowering its average figure to a permissible level. From next year, the EU’s target for average CO2 emissions from cars is 95g per kilometre. In 2018, average emissions were 120.5g per kilometre, according to data supplier Jato Dynamics. FCA averaged 123g last year, according to UBS, which said the carmaker had the “highest risk of not meeting the target”. Analysts at Jefferies forecast FCA could face fines in excess of €2bn in 2021 when the new targets become law. A study by PA Consulting last year said FCA was likely to exceed the target by 6.7g of CO2 per kilometre — the biggest gap among the 13 carmakers it profiled. Tesla getting more money must be a good thing; its very existence is pushing other vehicle makers towards electric. But this is a scuzzy way to do it. I’m curious about the rationale, if any, for NFC on iOS not to be managed by the same permission scheme as everything else. The one thing that comes to mind is: to force payment apps to pay an Apple tax, or, even worse, to lock out other payment apps and force everything through Apple Pay ? Talk to any US kid under 12 and Roblox and Minecraft are the two games they play all the time (Fornite above 12). Talking of Google and games, I’m amazed they haven’t simply scraped Apple’s ratings and applied them to the Google Play Store. That would cut a lot of work down for them.